You are here: Home / Live / live craft eat calendar page now live! live craft eat calendar page now live! good tuesday morning everyone! do you know what’s going on today? well, i don’t know what you’ve got going on, but i’ve got my tuesday full of some fun activities (playing with kids) and other necessary to-dos (chores/errands). the only way i can keep everything straight is by writing it all down on a calendar. i swear by calendars – if i don’t have something written down on one, i totally forget all about it. i suppose that’s why i’ve created so many over the last couple of years: yearly calendars, monthly calendars, weekly calendars, calendars for kids, etc. you can never be too organized! that’s why i put together an actual “calendars page” on my site where you can find all the calendars i’ve ever posted here on my blog (freebies!) or in my etsy shop. it will always stay updated with the most recent calendar available, and will include any new ones that get added over time. 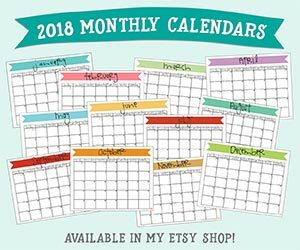 so if you’re looking for some kind of calendar, check that page first and you’ll see all that i have to offer you. all you have to do is click on it to get to a list of all my printable calendars! easy as pie. in the meantime, i hope you all enjoy the calendars and have fun planning and getting organized!